5 Times Wild Classic Slot Guide & Review - Casino Answers! 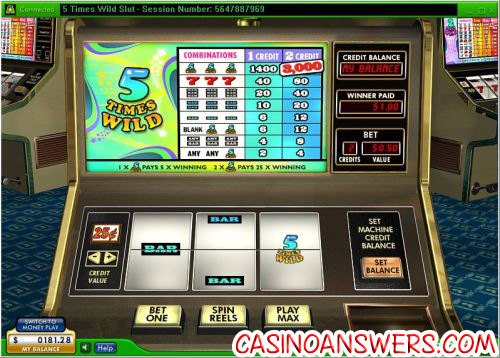 5 Times Wild is a 3-reel, 1-line classic slot machine developed by Random Logic, featuring a wild symbol and multipliers. You can play the 5 Times Wild classic slot game at Lucky Ace Casino and Littlewoods Casino. Bets on the 5 Times Wild slot machine are $0.05, $0.25, $0.50, $1 and $2. You can bet 1 or 2 coins per spin on the 5 Times Wild slot game. The lowest possible bet you can make is a nickel per spin up to the highest total bet of $4 per spin. 5 Times Wild is great for casual players due to the low betting range and the ability to multiply your winnings by 5X. To play the 5 Times Wild classic slot, hit the “Bet One” button followed by “Spin Reels” or play “Bet Max” to play the maximum bet. The highest paying symbol on the 5 Times Wild online slot is the 5 Times Wild symbol. Three 5 Times Wild symbols on a 2-coin maximum bet can win you the 3000 coin top jackpot. The 5 Times Wild symbol is, of course, wild and will substitute for any other symbol in the slot game. One 5 Times Wild symbol will multiply your winnings by 5X, whereas two symbols will multiply your winnings by 25X! Obviously, this is the most desired symbol on the 5 Times Wild slot and one you should look out for at Lucky Ace Casino! There are 8 winning combinations on the 5 Times Wild traditional slot machine. The full payout schedule is as follows (1/2 coin payouts in parenthesis): 1 5 Times Wild symbol (2/4), any 3 Bar symbols (4/8), 2 5 Times Wild symbols (6/12), 3 Single Bar symbols (6/12), 3 Double Bar symbols (10/20), 3 Triple Bar symbols (20/40), 3 Seven symbols (40/80) and 3 5 Times Wild symbols (1400/3000). The payouts are not very high on the 5 Times Wild classic slot machine, so you will need to depend on the 5 Times Wild symbol to get big wins. To see if you can get that 5X multiplier on the 5 Times Wild slot, sign up and make a deposit today at Lucky Ace Casino! Can USA players play the 5 Times Wild classic online slot for real money? Unfortunately, Random Logic online casinos are not accepting players located in the United States of America for real money. For a great selection of USA-friendly slot machine, please visit Caribbean Gold Casino! Does the 5 Times Wild slot machine have a progressive jackpot? The 5 Times Wild classic slot game lacks a progressive jackpot. However, you can find a similar slot machine with a progressive jackpot at Lucky Ace Casino and Littlewoods Casino on the 2 Times Extra Wild Progressive Jackpot Slot Machine!